2016 Hot Firm List, a prestigious list honoring the fastest growing firms in the A/E/P and environmental consulting industry. WGI placed #5 on this list, up from #39 in 2015. In an industry comprised of over 100,000 firms, those who made the list demonstrated their ability to thrive and now be recognized among the elite 100 fastest-growing firms. Placement on the list is based on both percentage revenue growth and dollar revenue growth over a three-year period compared to the other entrants. WGI placed #19 on the list of 2016 Best Firms To Work For, up from 42 in 2015. This list honors the creation of outstanding workplaces, recognizing WGI’s ability to inspire its teams to perform at the highest levels and create an environment where associates feel valued, can make a difference, and can clearly see their contribution to WGI’s overall mission and success. For the first time, WGI Creative entered The Zweig Group’s Marketing Excellence Awards, recognizing outstanding and effective marketing in the following categories: Online Marketing, Internal Marketing, Special Event Marketing, External Newsletter, and Integrated Marketing. WGI was recognized #2 in the Integrated Marketing category and #1 in the Internal Marketing category. 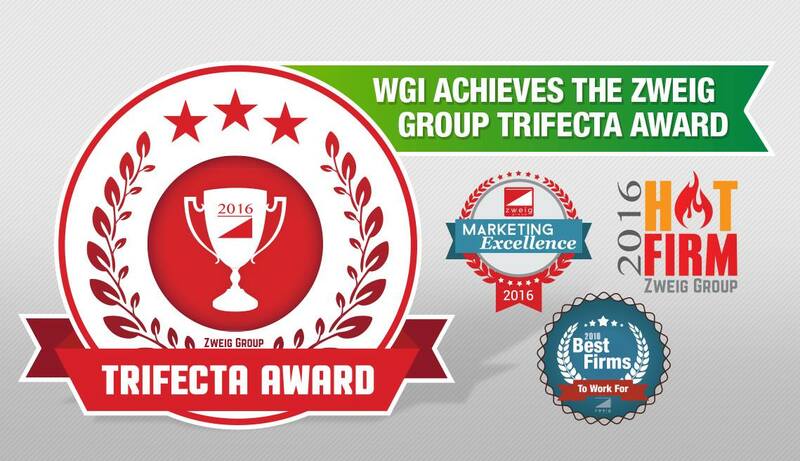 Finally, firms that placed well in Best Firms to Work For, Hot Firms, and Marketing Excellence Awards are awarded Zweig’s 2016 Trifecta Award – another first for WGI, bringing the total to five.